Organic Body Wash | Breezy Mama Breezy Mama - Expert parenting advice, celebrity interviews, product reviews for kids, moms and babies and more! I’ve said it before, and I’ll say it again–I love the Dr. Robin line. Last summer, I raved about her sunscreen for children. This summer, I’m raving about her Soothing Body Wash and Shampoo. With just the faintest smell of lavender, this organic wash got my son’s thick hair, as well as my daughter’s long, curly hair, clean as can be (something I’m seeing less and less with children’s washes). It contains quinoa which helps moisturize with it’s protein-rich amino acids and coconut oil for gentle cleansing. (Interesting fact–coconut oil also has anti-bacterial properties!) Because there’s no parabens, phthalates, synthetic fragrance, sodium lauryl sulfate or irritating chemicals, the wash makes it great for babies with normal, sensitive or eczema-prone skin. And, of course, I can never get enough of the adorable packaging–can it be any cuter?! 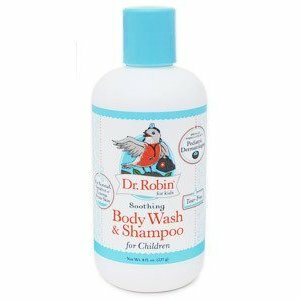 To order Dr. Robin’s Soothing Body Wash and Shampoo, $17.50, click here. Sounds great! I want to try it. FYI it’s spelled “squeaky”.